Holeing up in Back Creek, Annapolis, in an attempt to avoid the worst of Sandy turned out to be a good decision but left us cold, damp, and drained. We had to get South but, believe it or not, a serious cold front materialized out of the aether waiting for us at the bottom of the Bay promising very strong winds and rain. We thought that if we could get down to the bottom of the Chesapeake fast enough, we could duck into the Elizabeth River and maybe even the ICW before it strikes. In bicycling that’s called riding on the rivet which, back in the day, bike seats were made of leather and riveted together and the last rivet on the horn of the seat was where you ended up riding if you were maxed out, but too tired to stand on the pedals. 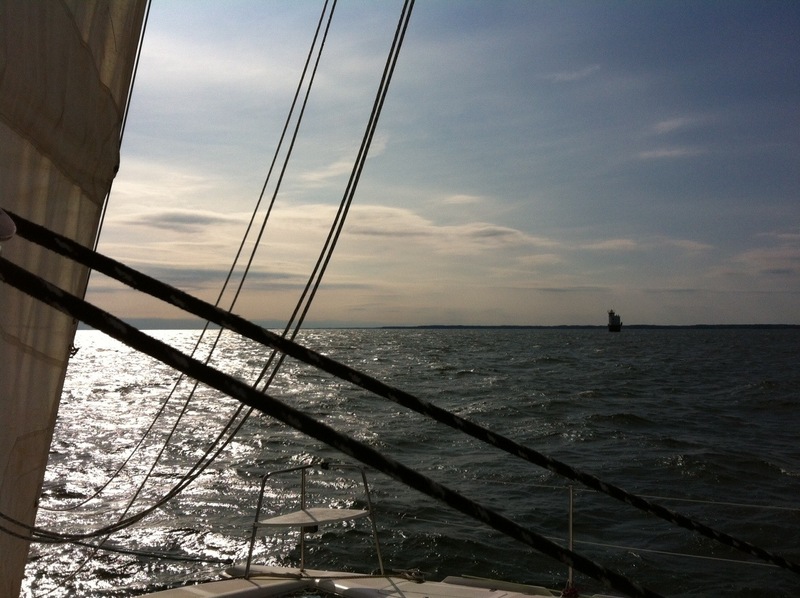 We averaged over seven knots on our journey to Norfolk and that’s without use if our mainsail, which is something I really don’t want to talk about, except to say mistakes were made. But with the help of friends we were able to straighten out the mess and, as they say in North Carolina, we lucked up! We found a mini hurricane hole at the ferry dock in Portsmouth which we are tied to as I write this. No services but the price is right. This was another free dock on the Piankatank without services including no pizza delivery! That’s life on the water. Yes, that’s the cruising life. One day you’re down, the next you’re back on top. 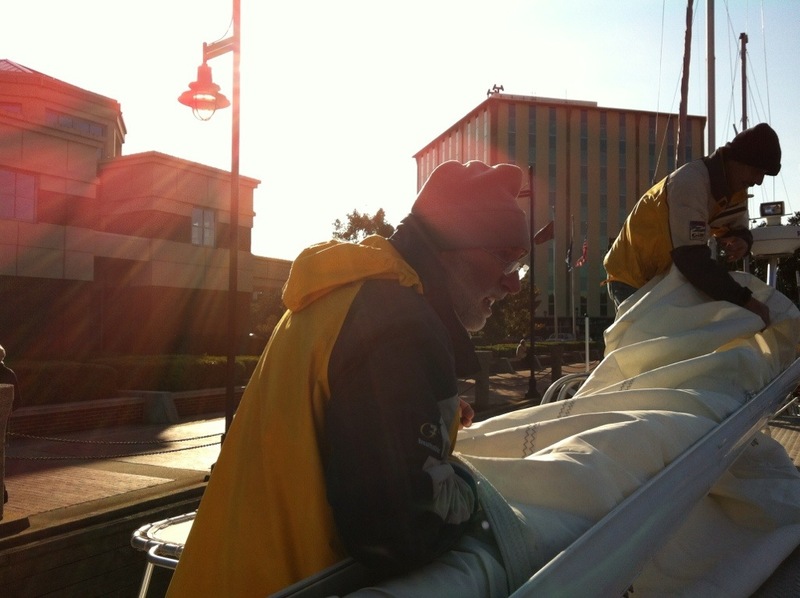 We made Portsmouth in record time and were happy to get ahead of the weather. Just as we were leaving the Tidewater fuel dock we got a text from Alan who said there was room at the free dock by the north ferry landing. Yippee! Another free dock night! 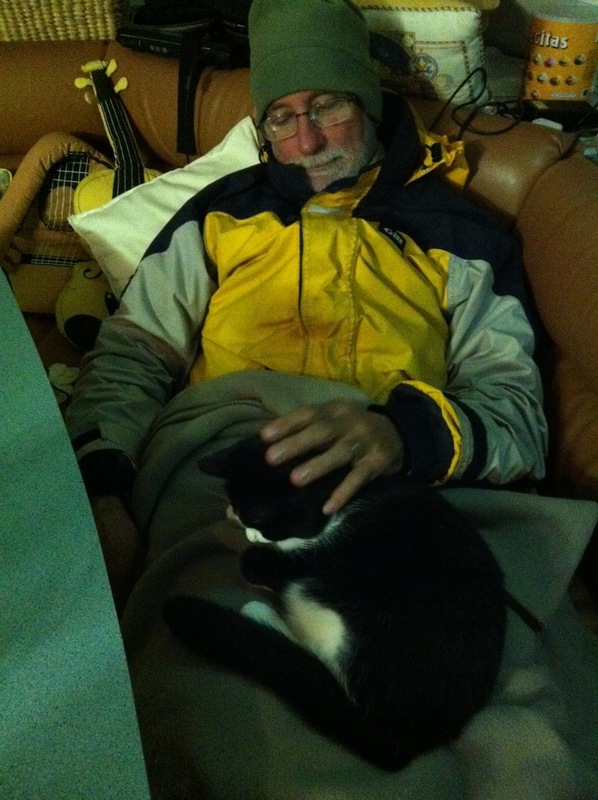 This is purely a tie-up, no water or electricity, but we sometimes like a break from the drudgery of anchoring. 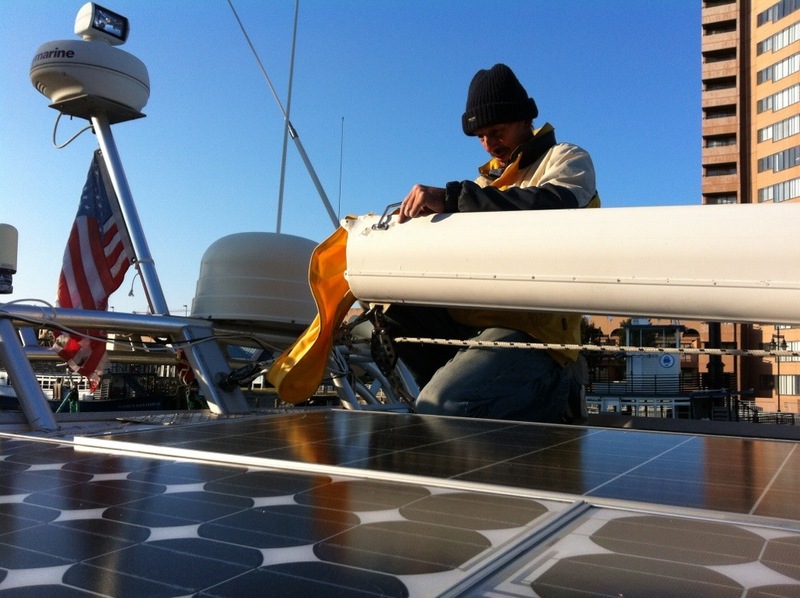 Alan took our docklines and helped secure Escape Velocity, then climbed up on the roof to take a look at the boom. “Do you mind if we have a go?” he asked in his understated Brit way. 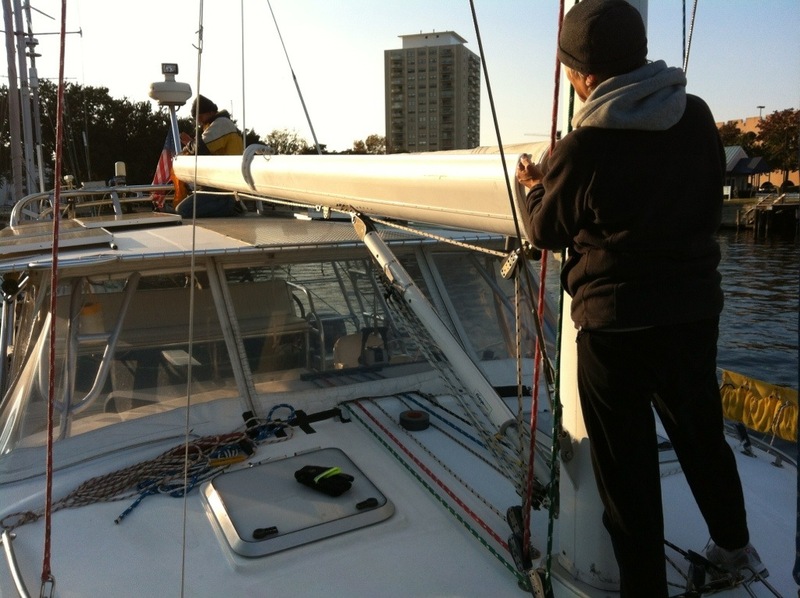 We untied the sail and while i manned the furler with a manual winch handle he and Jack pulled and tugged and wrangled and yanked on the sail, unbolting and removing the broken battens as they went. It took a good hour, a bit of Alan’s blood and the rest of the energy Jack and I had left but eventually the whole thing lay on deck. We got the foot reattached properly, flaked the sail on deck and carefully refurled it, an exercise that took several tries because without the battens the sail was difficult to get completely straight on the mandrel. We think we’re pretty close to good on that. We still have to remove the furling line, which is half wound onto the drum. It shouldn’t be when the sail is furled. It appears the sail is no worse for having suffered our errors. 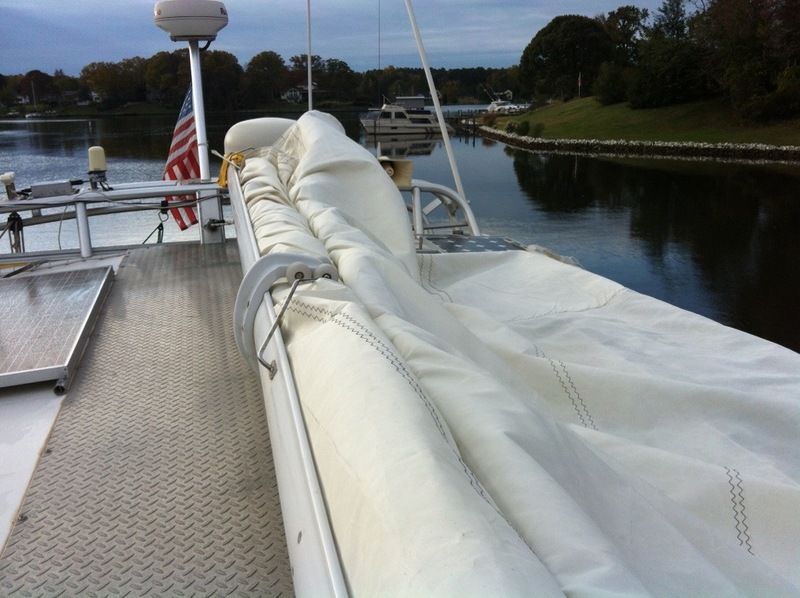 We’ll need new battens and some stitching, maybe a new batten pocket, certainly a new cover. Of course we have yet to try raising it, but that will have to wait. And we owe Alan big time. 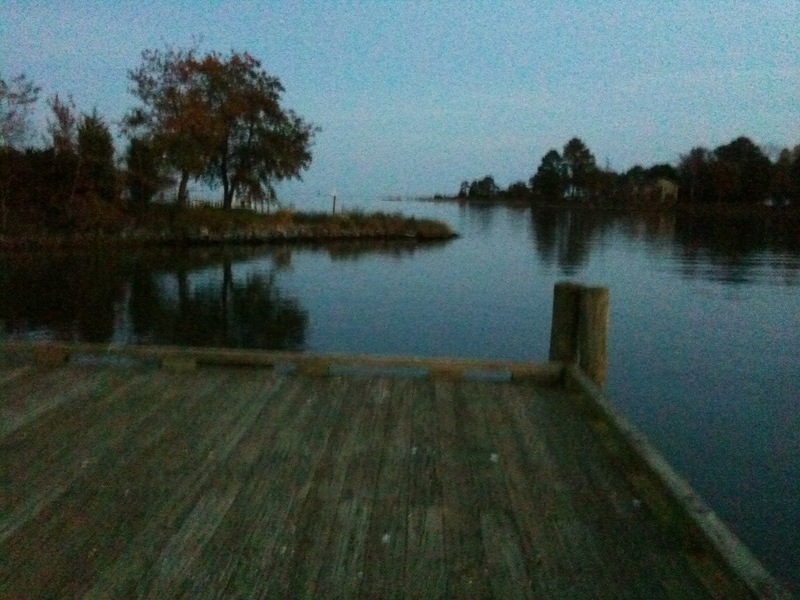 We’re planning to stay tied to this dock to wait out the weather and watch the election returns, then we’ll motor into the Intercoastal Waterway again, this time toward the Great Dismal Swamp. The past couple of days have not been what you would classify as fun. I’d still rather be aboard Escape Velocity than anywhere else but I sure wish we were someplace warmer. We have well and truly screwed up our mainsail and furler. We returned to the anchorage after the mishap but couldn’t even assess the situation until the next morning because of high winds. When we finally got a good look, we could see that when we furled the main back on while the sail was out of control (that was our biggest mistake) the battens got caught and shredded in the mechanism, and now are jammed against the boom, keeping us from turning the mandrel to release the sail. We assume that detaching the mandrel from the boom would allow us to lift the whole works out and release the sail and broken battens but it isn’t obvious to us how to do that, and we’re reluctant to try and effect this kind of operation at anchor in 40 degree weather. Complicating things is another storm brewing along the coast that’ll reach our current position on Wednesday with conditions approaching what we experienced with Sandy. No, thanks. 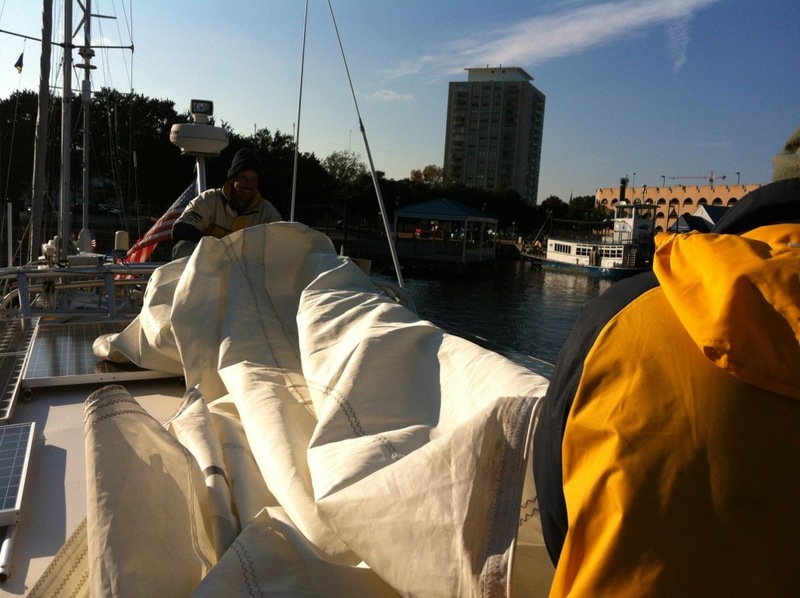 We decided to wrap the mainsail up, lash it securely to the boom and get the heck outta Dodge. Sunday there was very little wind, and what there was was on our stern, so we put up the jib for a little push and motor sailed as far as we could in a very long day. The sun came out and cheered us a little but added no heat whatsoever. 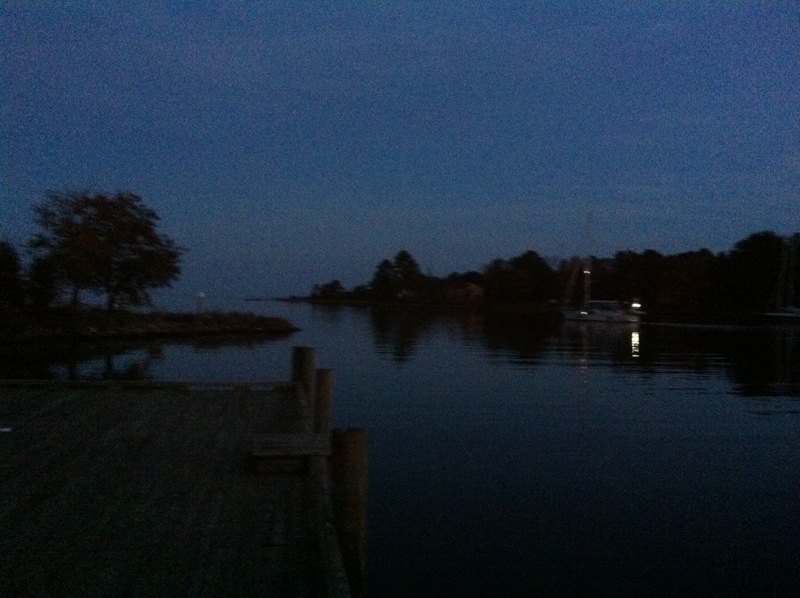 We made it as far as Deltaville, VA, and went in the back way to give us a head start in the morning. Our cruising guide advised there is a town dock where you can tie up for free. We found it easily and despite a sign warning no overnighting allowed, we stayed put. We had a fantasy that we would call for a pizza to be delivered to the dock, but no, we’re in rural Virginia, the Bible Belt, and everything is closed on a Sunday night. Jack and Izzy settled in with a blanket while I cooked dinner. 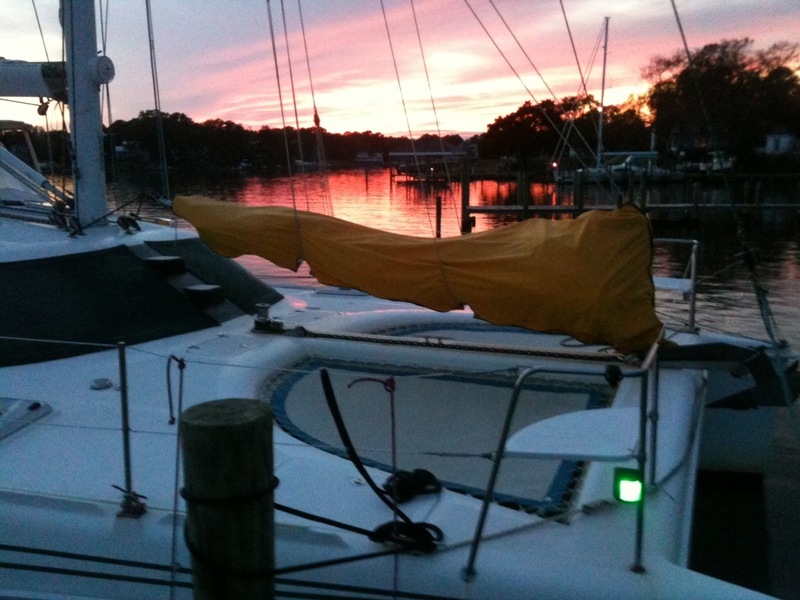 We both had a fitful night, worrying about the mainsail and the weather, and the unfamiliar sounds of being tied to a dock for the first time in months. We got underway again at 7am, before coffee even. I helped Jack navigate the narrow channel back out and we touched bottom briefly on a falling tide but we made it out safely and while Jack got us back on our southerly course I went below to make coffee. NOAA is predicting worsening conditions later today and we’re hoping to get at least at far as Portsmouth where we can fuel up and get out of the way of the coming storm.